I’ve always found desks to be uncomfortable. I could never get the chair the correct height, the screen would be too close, or the desk always felt too high. I had originally chosen to study Cognitive Science when I determined that you could get a degree focused on making things easier to use. The desk is just another interface, so why not make that easier to use? I found that there were lots of resources on desks. There was definitley a big push for standing desks. 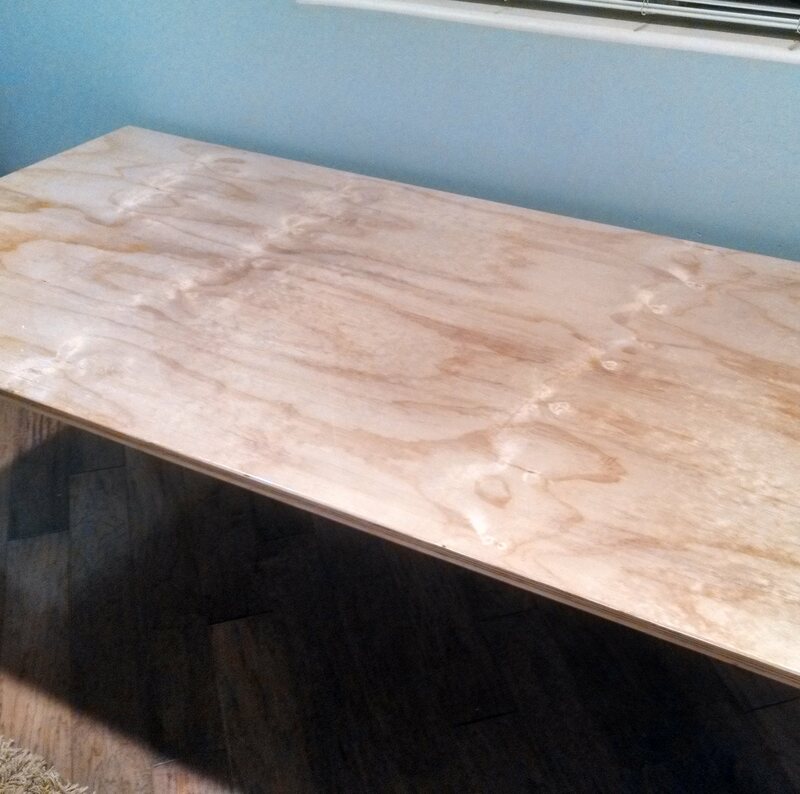 I also found some interesting DIY desk designs that I started to take some inspiration from. My true friend for this project and real eye opener ended up being the morphology analyser. This is the first time that I realized that my measurements were a little out of the norm. Things started to snap into place. Why it’s so difficult to reach the handles on exercise equipment. Why shirts always seem too short and long at the same time. Why chairs are so uncomfortable. I have a really long torso, short arms, and short legs. After taking my measurments it was clear why no desks were ever the right fit. I needed the desk to be way lower to the ground so my feet could rest flat. I needed the monitors to be raised up so they were at the right level compared to my eyes. I needed the top of the desk high enough that my short arms would be at a 90 degree angle. I needed the desk to not be too thick so I could still sit under it. Once my paper prototype was diagramed, I was ready to roll. 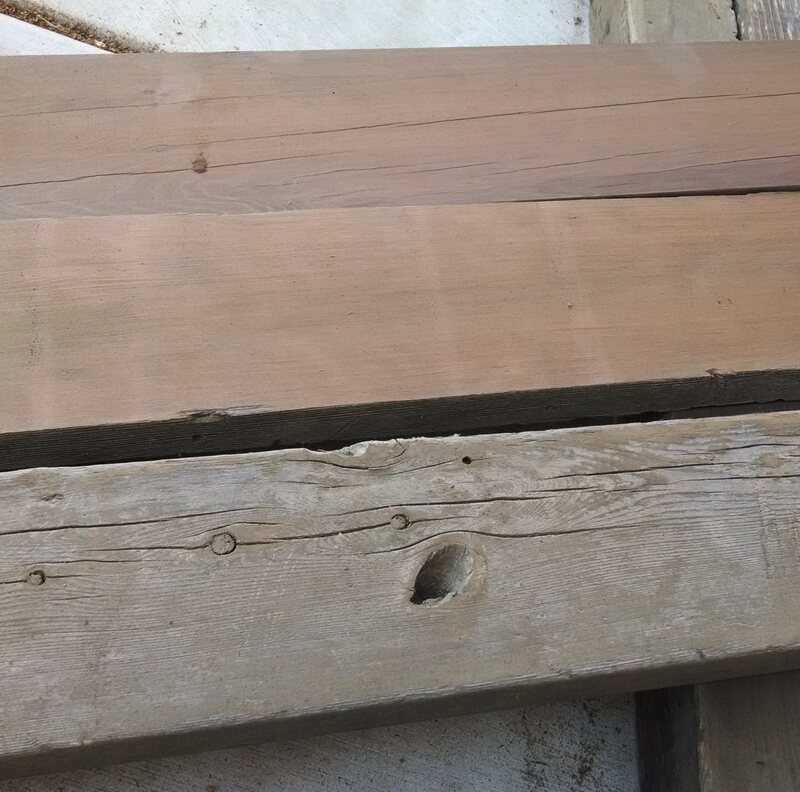 I found some old lumber that my grandfather had used for a couple of projects years ago. 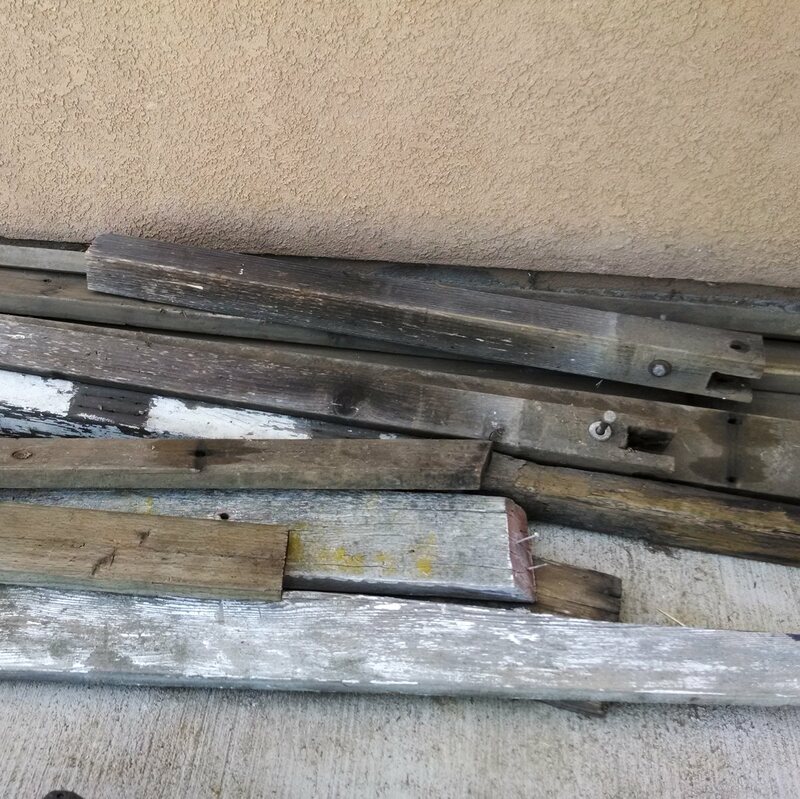 I decided to reclaim some of the lumber for my project. After selecting the straightest pieces, I sent it through a planer a few times to flatten and refinish it. I followed that with some sanding to smooth it. 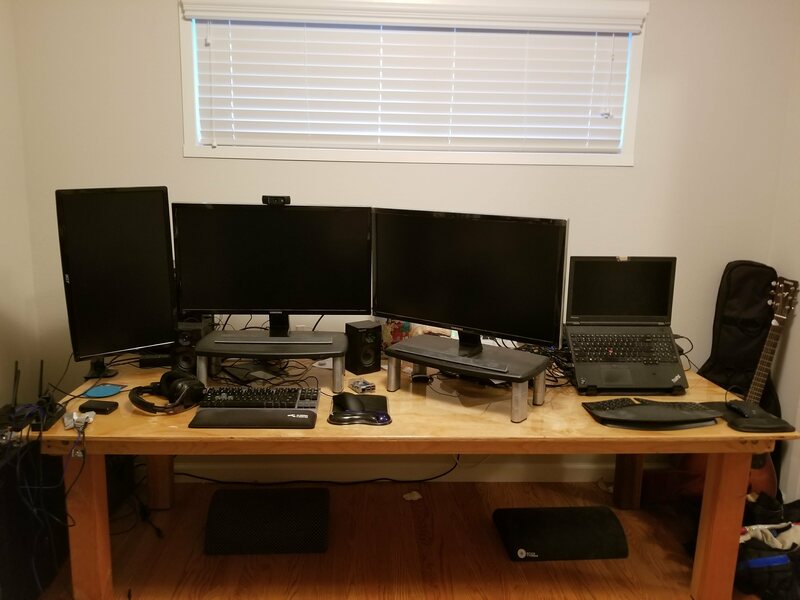 I decided to build a very long desk because I regulalry need to run two computers for my job. 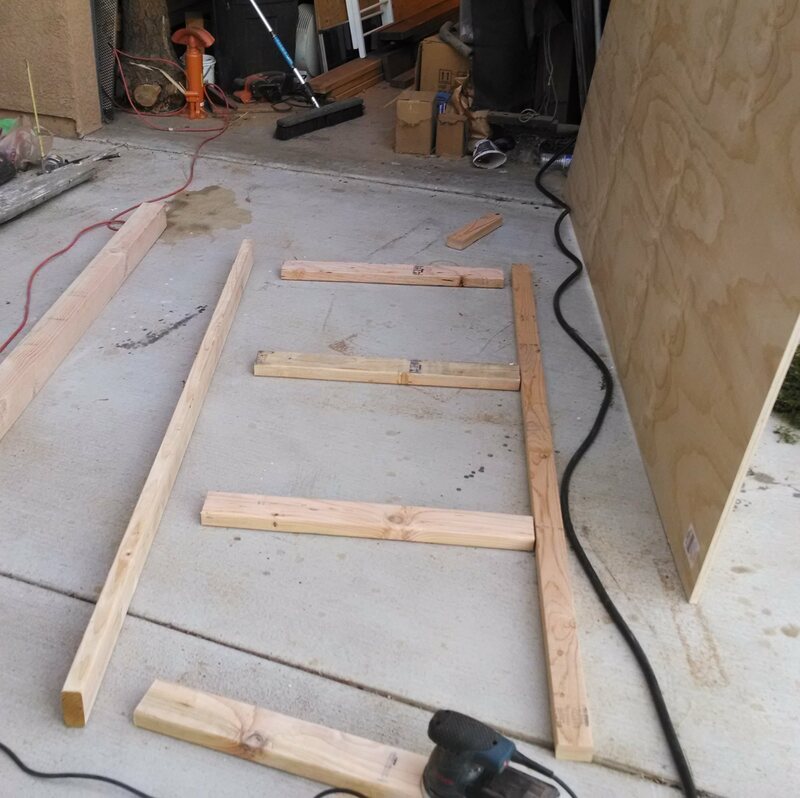 I picked up some additional lumber for the support structure directly underneath the desktop. 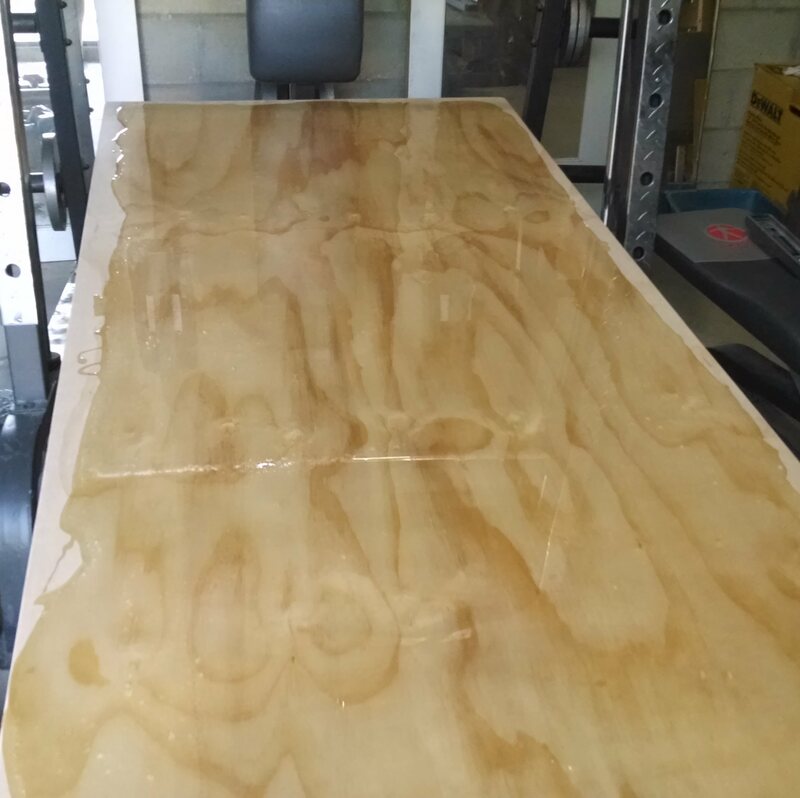 I decided to use a resin on the top to protect the tabletop. 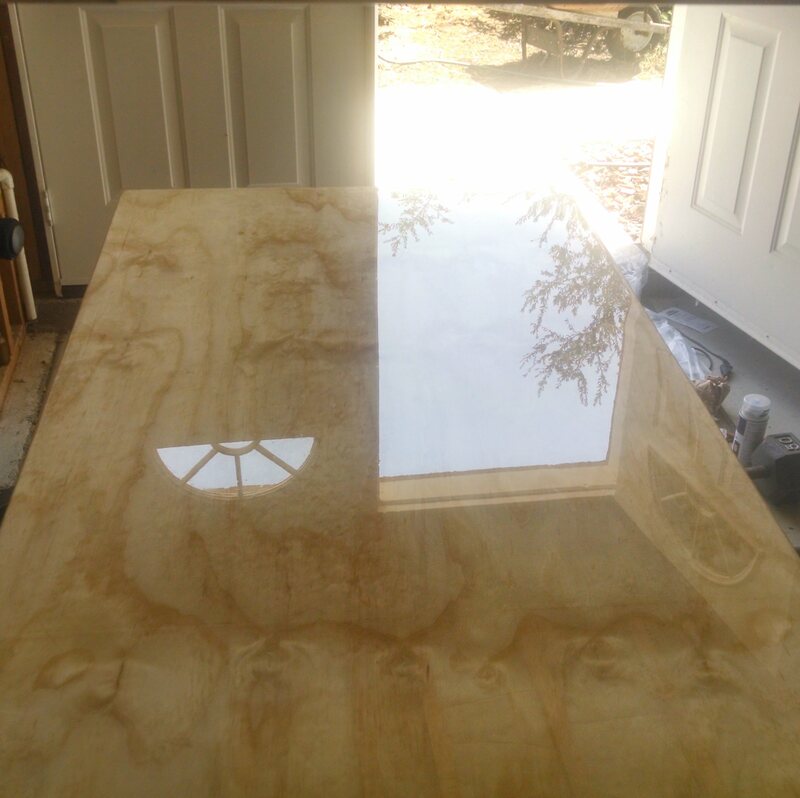 I had seen this used before and the finish seemed to be very strong and durable. 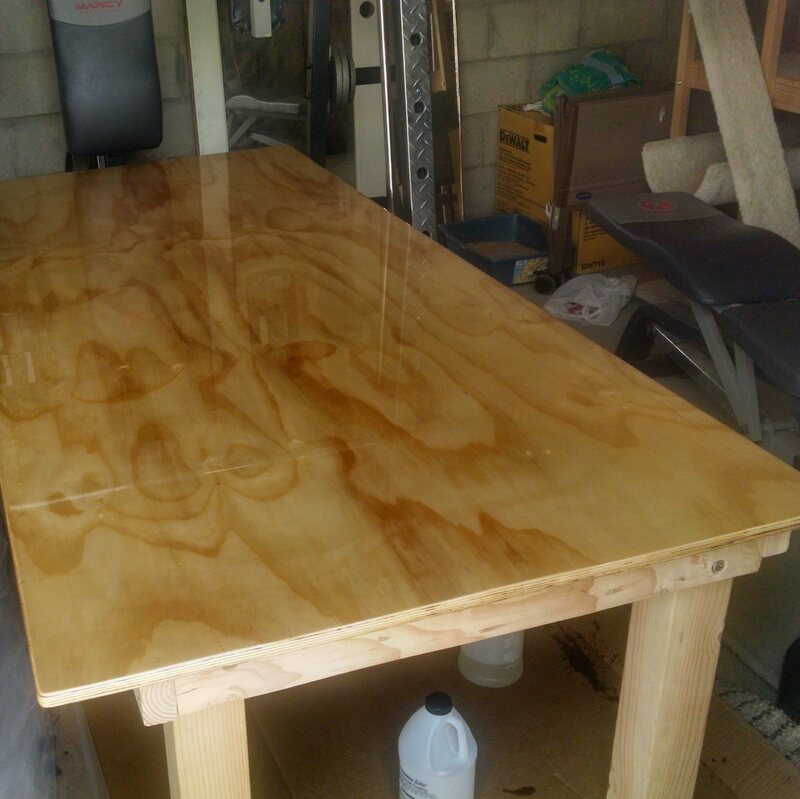 I wanted something that would be easy to clean and would look nice, so I used this epoxy resin. The top was sanded smooth with 600grit sandpaper to ensure a great finish. The pine toping to the plywood had some great natural markings that would really shine in the final product. 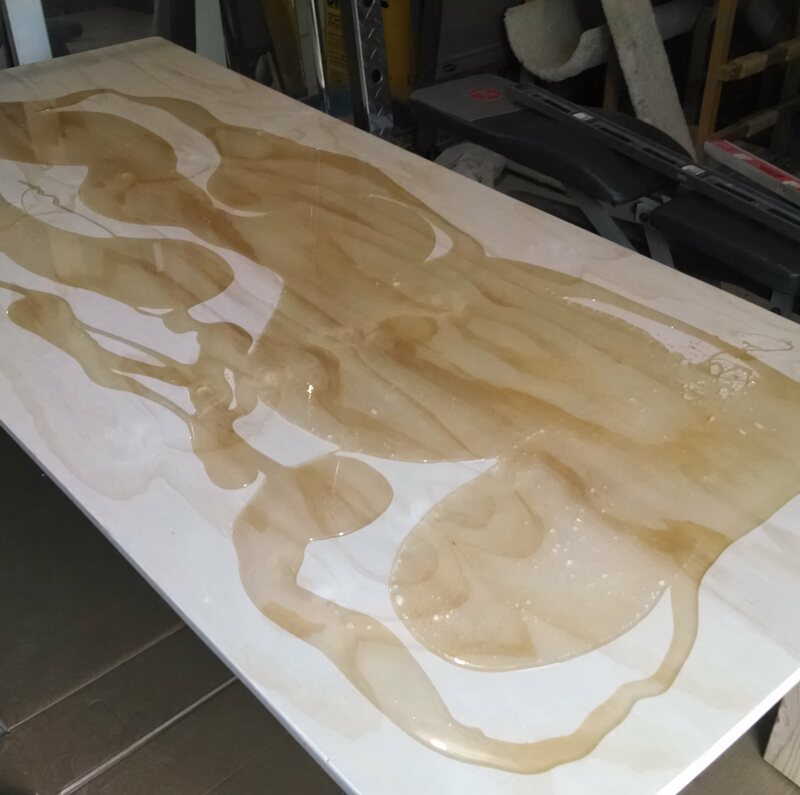 I started spreading the resin over the top of the desk. I had limited time to work with it before it started to harden. About 45 minutes in the surface started to become tacky. 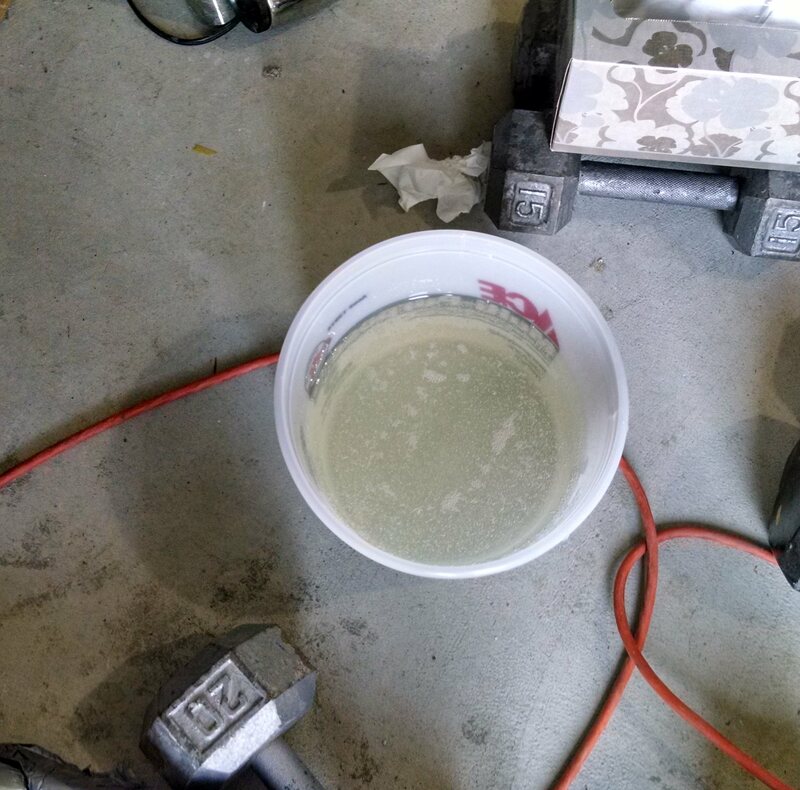 I got a pretty even coating and then used a hot air gun to eliminate any bubbles in the resin. You run the gun along any air pockets which causes them to pop. 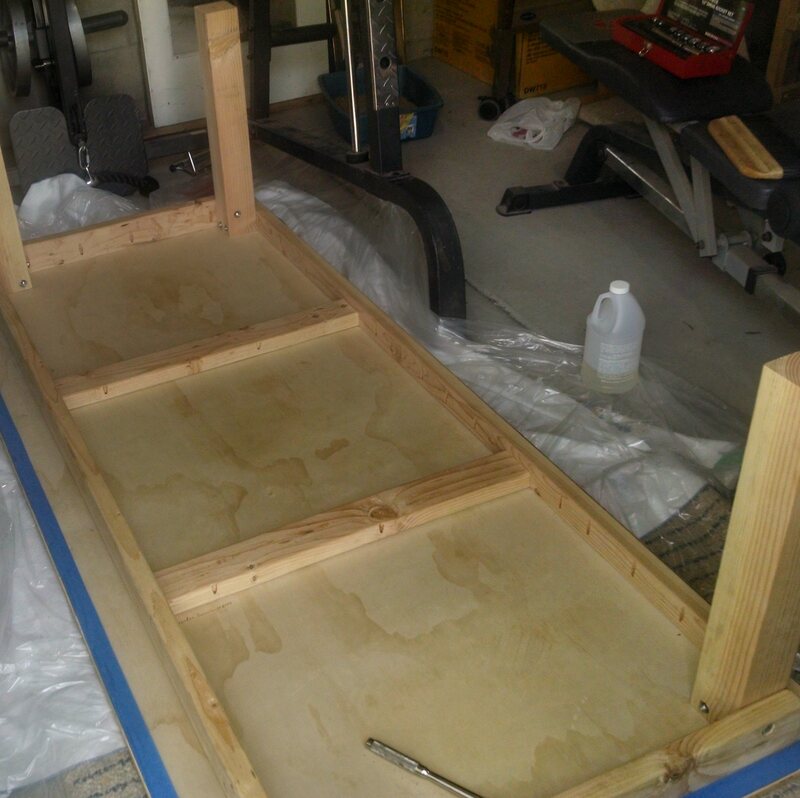 Since the resin is self leveling, it will fill in the pockets by itself. You can’t stay in anyone place too long or it will start drying. Three days later I came to checkout how it turned out. It was beautiful. It was nicely finished, the air pockets were minimal, and the top looked great. It was hard to convey how miraculous the top looked, but this mirror like quality was really visible from this angle. I started to worry it would be too difficult to work on, but that didn’t need to be a concern. 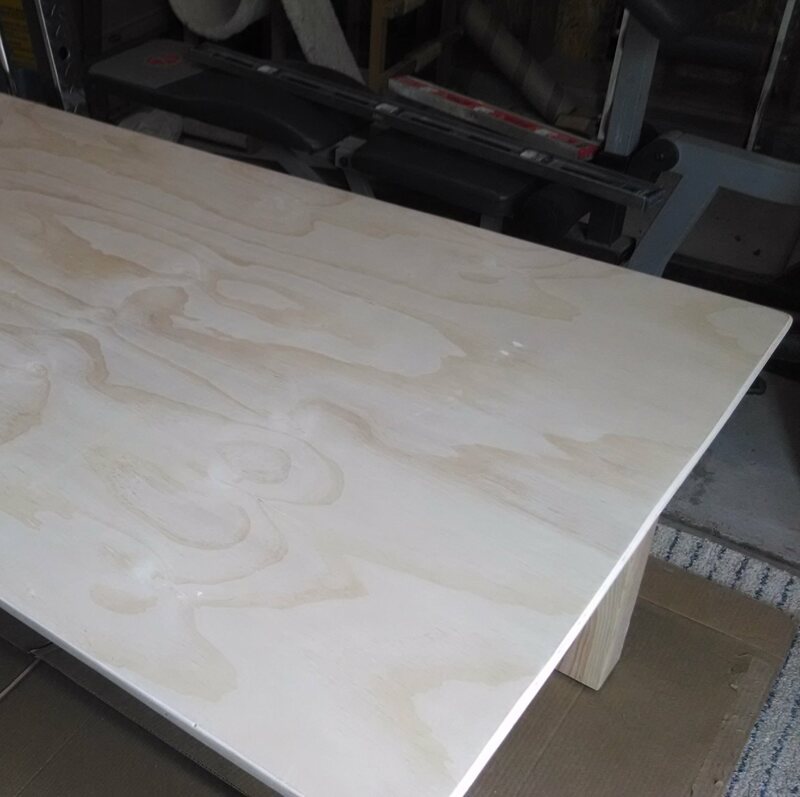 I built the table with portability in mind. The legs are all removeable, so it can lay flat. The legs ended up being kind of a pain to reinstall, but it’s definitley doable. It looks pretty good setup inside. Definitely the cleanest it will ever be.